Two Nebraska wrestlers advanced to the quarterfinals of the NCAA Wrestling Championships in Cleveland, Ohio, but the biggest story from Day One for the Huskers happened before any matches even began. True freshman Jason Renteria, unseeded at 133 pounds, failed to make weight during weigh-ins one hour before the morning’s first match. He was disqualified from the tournament. Renteria struggled to control his weight for a majority of the season. He did not start competing until after New Year’s. Even after making his debut, Renteria missed a couple dual starts because he weighed-in too heavy. Although he did not wrestle any matches, he was still the first Nebraska true freshman to qualify for the NCAA Championships since Jake Sueflohn and James Green both made it in 2012. 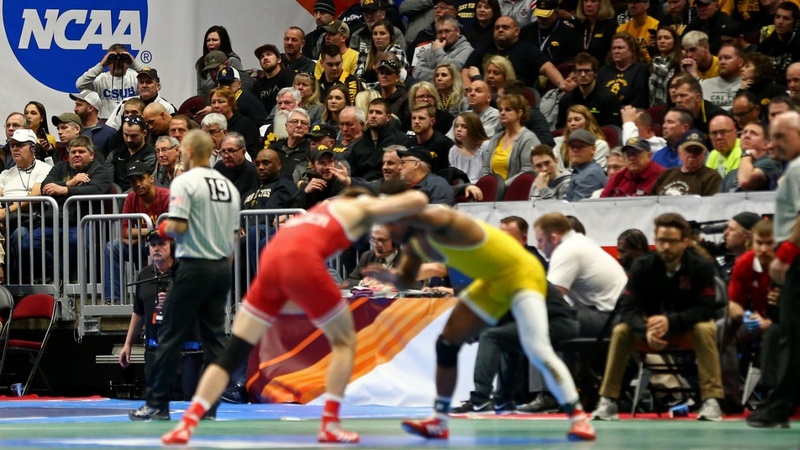 Down to six competitors when Session I started at Quicken Loans Arena, the Huskers split their first-round matches, advancing three to the Round of 16 in the championship bracket, while dropping three to wrestlebacks. Returning All-American and junior Tyler Berger, and sophomore Isaiah White, who was a Division II National Champion at Notre Dame College last year, were Nebraska’s two quarterfinalists. All six Huskers are still alive for Day Two competition. Nebraska is in 20th place in the team standings with eight points. Berger, seeded No. 8 at 157 pounds, scored Nebraska’s first points of the tournament with a 9-3 decision victory against Joseph Velliquette of Pennsylvania in the first round. Berger would go on to be Nebraska’s first quarterfinalist with an overtime victory in the Round of 16. In their third matchup this season, and fifth of their collegiate careers, Berger faced No. 9 seed Archie Colgan of Wyoming. Berger continued his previous trend against Colgan with a 2-1 win in tiebreaker-1. He improved to 5-0 against Colgan. White also earned a decision in his first-round match. White, seeded No. 11 at 165 pounds, defeated Demetrius Romero of Utah Valley 9-4. White’s Round of 16 match also went into overtime, and, like Berger, he also came out victorious. White avenged a dual-season loss against No. 6 seed Richie Lewis of Rutgers, winning in sudden victory-1, 3-1. Nebraska’s highest-seeded wrestler and redshirt freshman Taylor Venz picked up bonus points in his opening match. Venz, seeded No. 7 at 184 pounds, defeated Chaz Polson of Wyoming by technical fall 17-1. This was Venz’s second technical-fall victory against Polson this season. He won by a score of 18-2 on Nov. 17. Venz faced another previous regular season opponent in the Round of 16, but couldn’t get his second win. North Carolina’s Chip Ness scored a key reversal and nearfall points to pull away from Venz late in the match, and went on to win by decision 11-6. Three Huskers found themselves in the wrestlebacks after losing their first match on Thursday. Redshirt freshman Chad Red Jr., unseeded at 141 pounds, lost a close decision, 4-2, against No. 7 seed Brock Zacherl of Clarion. In the first round of wrestlebacks, Red defeated Thomas Thorn, an All-American last season for Minnesota, by decision 8-3. This was Red’s second win against Thorn this season. He won 5-3 in sudden victory at the Daktronics Open. At 149 pounds, returning NCAA qualifier and senior Colton McCrystal, seeded No. 13, was knocked out of the championship bracket by unranked Jarrett Degen of Iowa State, 9-5, in the first round match. McCrystal bounced back with a 5-2 decision victory against Tyshawn Williams of Southern Illinois University Edwardsville in the wrestlebacks. Redshirt freshman Eric Schultz, unseeded at 197 pounds, was seconds away from a first-round upset against No. 14 seed Cash Wilcke of Iowa, but couldn’t hold on. With less than 30 seconds remaining in the third period and the score tied 1-1, Schultz scored a takedown to take a 3-1 lead. In a wild scramble, Wilcke escaped and scored a takedown just before time expired to win 4-3. Like Red and McCrystal, Schultz advanced to Day Two with a decision victory in the wrestleback bracket. Schultz beat Jacob Seely of Northern Colorado 3-2. Session III will begin Friday morning at 10 a.m. CT with the quarterfinal round of the championship bracket, followed by the second and third rounds of wrestlebacks. The session will be broadcast on ESPNU.